The felinity fair-isle socks (I need a much better name than that!) are moving along pretty nicely. Sock one is in the bag*, and sock two’s past the heel. I’ve worked out how to move the jog to the other side for the leg, and am just thinking about how to handle it in the foot. *Well, not really in the bag. I actually do need to reknit the toe (sigh) from the point where the final pattern repeat takes place. See that little dimple in the colourwork section just before the solid black toe? 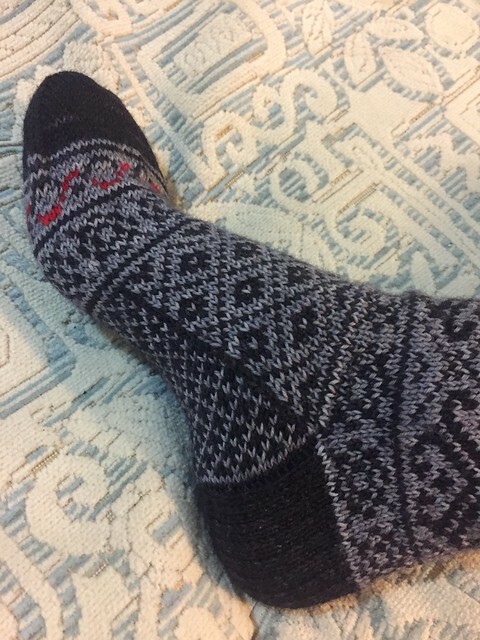 That’s because I’d normally decrease down to fewer stitches around the foot than there are around the leg, but on this pattern you have to keep the numbers the same for the colourwork patterns to work. So I did the actual toe in a smaller needle size, which helped with the fit, but what I really need to do is start the smaller needle size further back. So I didn’t, in fact, manage to knit the toe correctly first time. NEVER MIND. I am still pretty jazzed about this whole pattern, so I’m not too bothered about it. And yes, tips like this will be in the pattern notes! In other sock pattern news, remember my last pair of helical socks? They have been going through an incredibly helpful testing process with some seriously ace test knitters, and the plan is to have the pattern live later this month. So watch this space. Want to see what my sock knitting buddies are up to this month? Well, thanks to the veritable EXPLOSION of new sock knitters joining up with us recently, we have changed things a little bit to make sure everyone is visible and nobody accidentally gets missed out. The new system is that our longest Once Upon a Sock member Paula at Spin a Yarn is now hosting a OUAS link-up every month – check out the link party throughout the day today to see who else has been doing some sterling sock knitting work recently. I took a look at my Ravelry projects page yesterday and realised that I am seriously struggling to finish a lot of WIPs at the moment. The trouble is I can’t stop thinking of new things to cast-on! 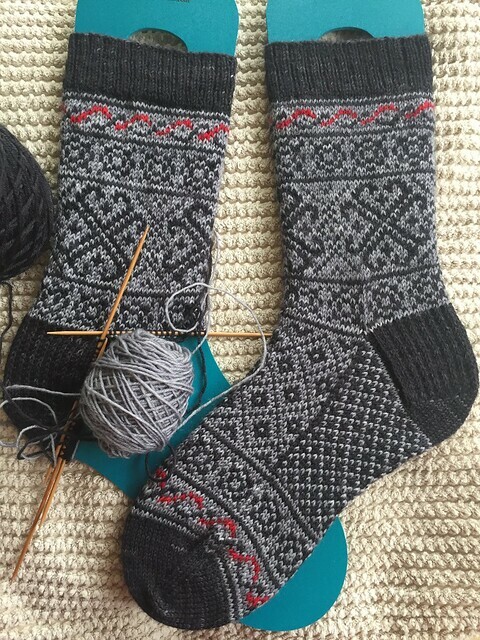 I very nearly stopped working on these fair-isle socks last night to cast-on for some mitts to match my cabled-edged cowl (I went to sleep dreaming about them last night), but then had a stern word with myself and put the dream-mitts on hold for now. Anyone else suffering from startitis? What patterns (real or imagined) are keeping you awake at night right now? Previous Post Yarn loveliness for me! Those look fantastic!!!! I am not allowing myself to cast on anything until I do finish up a few things, although to be honest that may not last long…. Thank you! I am being very stern with myself that I am not allowed to cast on anything new until I have at least finished this pair of socks. It is sooo easy to give in to the casting-on temptation, *sigh*. Gorgeous socks! Were it me I would start the toe with a plain knit row then a decrease round to bring the stitch count down, along with the smaller needle to get rid of the pucker. Bet they’re lovely warm too! I have a sock design rolling around in my head but i’m trying my best to stick with the three projects at hand and not cast on anything new. It helps that the yarn for the new design is still in the skein and not caked so I can’t cast on impulsively ! Ahh thank you! Interesting, I could reduce the stitch count a couple of rows earlier potentially. I’m approaching that point on the second sock (haven’t reknit the two on the first sock yet) so will see how I get on. Soooo many things we could be knitting. If only we had more pairs of hand/infinite spare time. The socks are stunning!! I’m also struggling with the number of WIPS I have versus the number of things I want to cast on at the moment .. the knitter’s perpetual conundrum! Awesome socks. How warm this pair must be w/all of the floats. Thank you! And yes they are pretty warm – just in time for spring, here, never mind! They’ll be perfect come autumn. I love the little pop of red on these! Ugh, WiPs. I have too many and I really need to finish a few before I can think about casting on more big projects! I really want to make a couple of cardis but have two crochet blankets and an almost finished jumper that I should do something about first! It seems that most of us are currently undergoing a bout of WIPitis! Glad I’m not the only one who goes to bed thinking of projects that then become my dreams! Nope, it happens all too frequently to me!